Although I no longer cook professionally, I will always be extremely grateful that I had the opportunity to do so. Not many people get the chance to leave a perfectly well-paying job to pursue a lifelong dream. I was lucky that I had a very supportive husband as well as a military retirement pension to fall back on when things got tight, and boy did they at times. The pay isn’t great, especially in the beginning, and the work is sometimes grueling, but for those with the passion, it can be a very rewarding career. Some of the colleagues with whom I went to culinary school have become very successful in the profession, and I am so proud of them. I made some wonderful friends in culinary school as well as learned to be a much better cook. I credit school for setting me on the right track to eating real food rather than boxed and bagged items off the grocery store shelves with ingredients I can’t pronounce. The philosophy at L’Academie de Cuisine was simple – learn to prepare classic French cuisine and you can cook anything; however, the staff at the school neglected to tell me one thing, which turned out to be the biggest benefit of all – we didn’t just learn to cook French food. Yes, we started with soup a l’oignon, making it with water at the beginning so they wouldn’t waste perfectly good stock on a bunch of non-cooks. And the week we spent on puff pastry dragged on and on – wellingtons, cheese straws, soup with a pastry crust… But because our pastry instructor was from Thailand and her husband was Indian, we also learned how to make all sorts of Asian and Indian dishes. Curries, salads, appetizers, you name it – they were all delicious and a nice break from the cassoulet and beef bourguignon we typically made for lunch each day. My first exposure to Thai food was actually in Budapest of all places, where a Thai colleague with whom I was traveling introduced me to a variety of his native dishes. We had just spent a week in Kiev and were desperate for some food with some flavor. 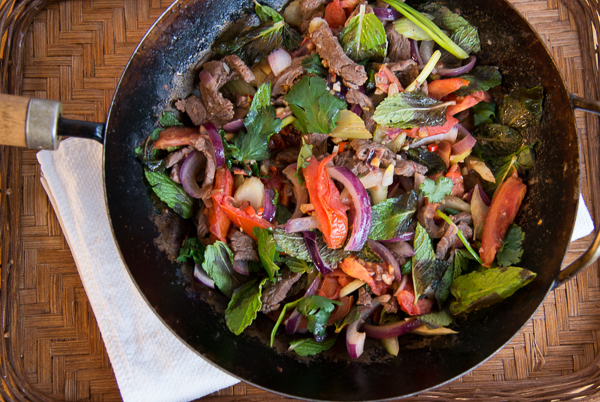 The dishes I later learned to prepare in school hooked me on Thai food for life, although I rarely make it at home. This dish reminded me of culinary school, but unlike many of the dishes we prepared there, it is very easy to prepare and makes a nice lunch or light dinner. 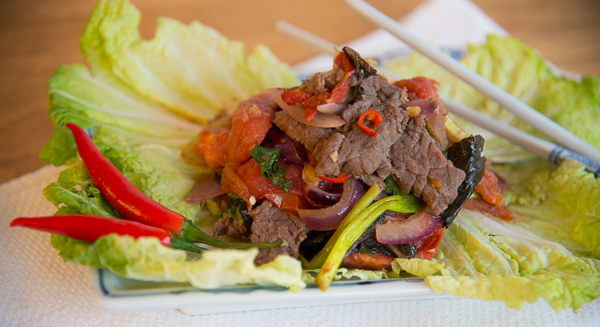 This dish was originally described as a salad to be eaten warm or cold over chopped Napa cabbage. 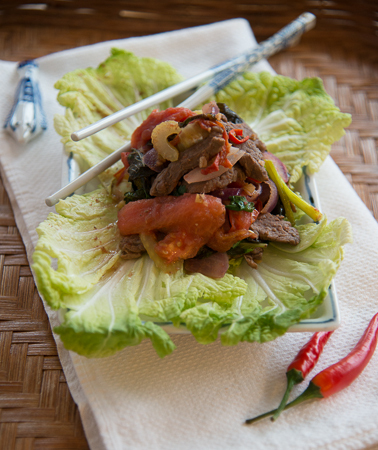 I turned it into “Thai tacos” by serving it warm wrapped in the Napa cabbage leaves. You could also serve it over hot bean thread noodles or rice. If you can’t find Thai chiles you can use 1 or two serranos. To facilitate slicing the beef very thin, you can place it in the freezer for up to 40 minutes. Cut the steak against the grain into very thin slices, then cross wise into 2-inch lengths. Slice the celery by placing it on its side and slicing at a 45-degree angle to achieve V-shaped pieces. Separate the cabbage leaves and set aside for serving. 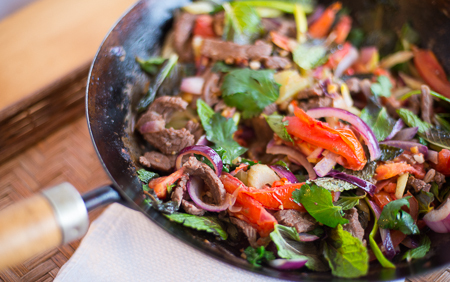 Heat a wok or large skillet over high heat and add the coconut oil. Heat the oil until it melts then swirl to coat the pan. Add the beef, season with salt and pepper, and sear, stirring until it browns. Add the ginger, garlic, and chiles and stir-fry for 1 minute. Add the celery, tomatoes, scallions and red onions and stir-fry until the celery begins to soften, 3-5 minutes. Stir in the lime juice, fish sauce and the sesame oil. Remove the pan from the heat and stir in the cilantro and the mint. To serve place a spoonful of the beef mixture onto a cabbage leaf, fold over and eat out of hand.